Plastic in the Great Lakes? How Sad…What Can We Do? Plastic garbage in our oceans has been a known problem for many years and a recent study conducted by University of Wisconsin-Superior researchers found plastic particles in the Great Lakes for the second year in a row. Plastic debris had previously been discovered in Lakes Superior, Huron and Erie and this recent research uncovered plastic in Lake Michigan and Lake Ontario. “The accumulation of plastic particles is a great threat to our natural ecosystem and to the humans who use Lake Superior for our drinking water supply,” said Mary Balcer, director of the Lake Superior Research Institute at UW-Superior. Local communities are grappling with the news and looking for solutions. Chicago has been considering and working towards a plastic bag ban for a while now and Madison, Wisconsin, which is about 79 miles west of Lake Michigan and nestled between Lake Mendota and Lake Monona is contemplating a ban on disposable plastic bags. Madison has made a strong effort to recycle single use plastic bags and other types of plastic, but news of plastic litter in lakes and a large amount of disposable plastic bags being found in the city’s waste stream has officials thinking a ban may be the best course of action. A Public Works team was created in the City of Madison to research whether a single use plastic bag ban would be possible. This team will report their finding to the city council in January 2014. Dr. Lorena Rios-Mendoza, one of the researchers involved in the University of Wisconsin-Superior study, says a ban on plastic bags would be a huge step to protect both the environment and aquatic life. 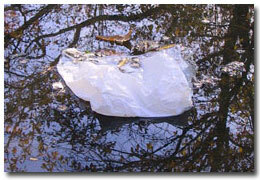 Eliminating single use plastic bags is the most effective way to reduce these bags becoming litter. As Madison proved recycling efforts can help manage litter, but they are not completely effective at putting an end to the plastic bag litter epidemic. If disposable plastic bags are banned that will alleviate a big chunk of the problem, and this will allow people to focus on other types of plastic trash and finding additional solutions to this multifaceted problem. Fortunately, the plastic litter problem in the Great Lakes was identified before it could become an unwieldy mess and concerned residents are looking to wrangle this problem under control. Hopefully Madison will be able to set an example to other communities and cities in states that border the Great Lakes and lead the way to a ban on single use plastic bags. If you want to do your part, check out our collection of reusable bags for your business retail and marketing needs by clicking on our link http://factorydirectpromos.com and remember to bookmark us for later. What Is The Impact of Plastic Bags on the Ocean? As a lover of the Great Lakes I really hate plastic pollution! Ugh! I just spent a great vacation on Lake Superior and will do my part to reduce (and eliminate) my use of single use plastic bags. Thank you Lindsay for doing your part on this eco-topic and so many others. For so long they’ve been saying how great Lake Michigan water was for drinking. One of our greatest sources of fresh water! So so sad that this problem is getting far out of hand.